Loy Krathong is considered to be one of oldest and best-preserved traditions in Thailand. It is the time of the year when Thai people pay respect to the goddess of the river, Phra Mae Khongkha, for providing water to support their lives throughout the year. Loy Krathong takes place on the evening of the full moon of the 12th month in the traditional Thai Lunar calendar; therefore, the exact date of the festival changes every year. This year, Loy Krathong will be celebrated on Friday 3rd November. Since Loy Krathong has long been celebrated by Thai people, it is one of the Thai cultures that our volunteers should experience if they get a chance. There will be celebrations all around the country and we would like to share our handpicked four Loy Krathong events that are worth participating in. In Chiang Mai, the Loy Krathong festival will be held on 2nd – 4th November 2017. During the festival, locals in Chiang Mai will decorate their houses, temples and roads with lanterns, creating beautiful illuminated sceneries all around the town. The focus of celebrations in Chiang Mai is around the Saphan Nawarat Bridge that connects Tha Pae Road on the western side of the river with Charoen Muang Road on the other side. 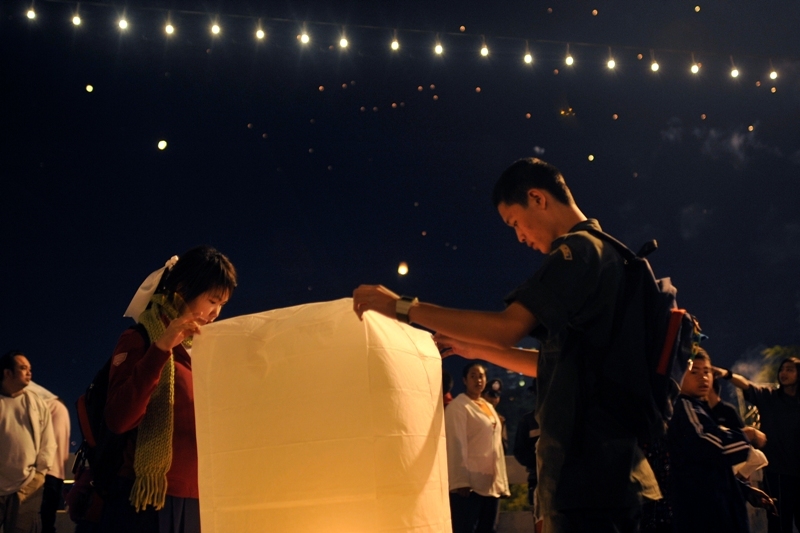 Apart from nicely lit town and the normal Loy Krathong activities, Chiang Mai also has Lanna’s Yee-Peng tradition to release sky lanterns or “Khom Loy” into the sky. It is believed that launching one of these sky lanterns means sending away a person’s bad luck and misfortune. 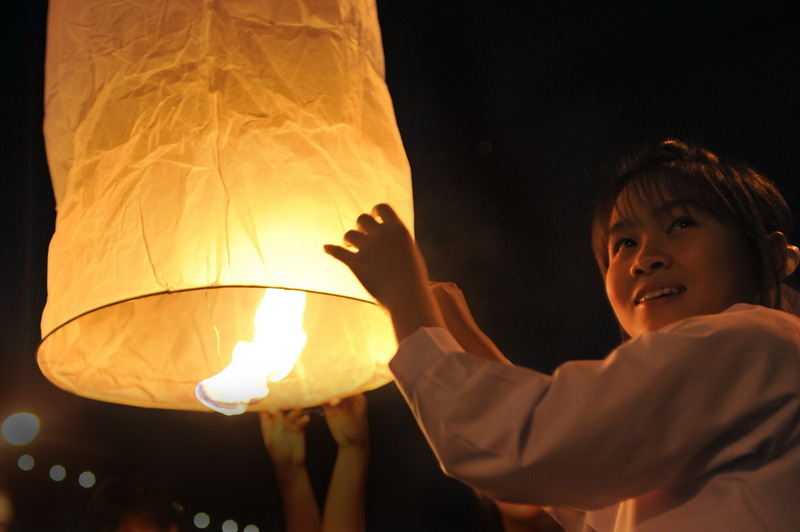 It should be noted though that “Khom Loy” could be dangerous as it could create fire or block the air traffic so the municipal has strict regulations toward the period of time allowed for releasing “Khom Loy” into the air. Tak is famous for its “Loy Krathong Sai” festival. Instead of releasing normal banana-leaf krathong into the water, people use coconut shells threaded together and launch them simultaneously, creating a beautiful long chain of glittering light on the Ping river. This year, the “Loy Krathong Sai” festival will be held between 3rd – 7th November. There will also be a workshop about how to prepare “Krathong Sai” open to the public around one week prior to the festival at Baan Hua Diat Community, Tak Northern College and Chalermprakiet Museum. The Loy Krathong Sai Kaab Kluay Mae Klong is unique to the Mae Klong district of Samut Songkhram province. 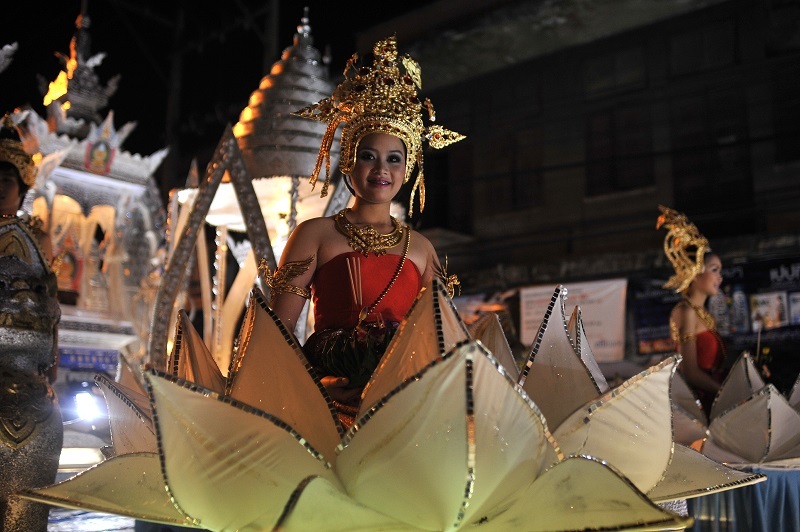 Unlike the normal krathong found in other parts of Thailand, the Mae Klong krathong kaab kluay float is made from the fibrous layer of the “trunk” of the kluay nam wa banana plant, a native species found in great abundance in Samut Songkhram. The use of the “trunk” as a krathong is an ancient tradition that has been neglected for a long period of time but locals have decided to revive it back around ten years ago. The most attractive aspect of krathong kaab kluay lies in its charming simplicity. It is a traditional folk wisdom to be wise in spending and make use of local natural resources without damaging the environment. This year, the Loy Krathong Kaab Kluay festival will be held on 3rd November at Wat Pummarin Kudeethong. Although Loy Krathong is celebrated all around Thailand, it is believed that Loy Krathong festival is originated in Sukhothai. This year, the Sukhothai Loy Krathong festival will take place on 1st – 5th November 2017 at Sukhothai Historical Park. The venue once lit up is a spectacular setting and sets apart Sukhothai Loy Krathong festival from the celebration in other cities. Visitors will get to experience a full set of magnificent Thai arts and culture, including a presentation of Thai performing arts, music and dance, as well as to enjoy a Thai-style Khantoke set dinner. After dinner, there will be a display of traditional Thai fireworks and the event will end with the releases of krathong in pools and ponds within the Sukhothai Historical Park. All in all, we would highly recommend everyone to participate in Loy Krathong festivals because it is a once in a lifetime opportunity to enhance your cultural experience with one of the oldest Thai traditions during your stay here. Happy Loy Krathong Day!